Our Comprehensive Energy Assessment can be used to make your home healthier and energy efficient. Accurate Energy Audits is trained to find the things you cannot see or are not aware of that affect your home performance. We take a complete "Whole House" approach to energy efficiency, so if your home is too cold or drafty, in the winter, too warm in the summer, or has excessive moisture problems, we can help you identify them so they can be fixed. This can make a substantial difference in your energy bills. Having us come to your house is also an educational experience as we explain the building science practices behind your problems so you understand them. 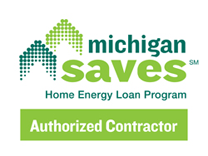 We will show you simple ways for you to save substantial energy and money. The full diagnostic assessment takes an average between two to three hours. The blower door, which is temporarily installed in an exterior door frame, acts like a whole-house fan depressurizing airflow out of the home. This makes hidden leakage very easy to detect. Air leakage is as much a problem as lack of insulation. Unsealed ducts in houses can lose up to 30% of direct air through leakage. If you have ductwork in unconditioned areas such as a garage or attic you can be picking up all sorts of contaminates and distributing them through the house. A.E.A uses FLIR high-resolution digital infrared cameras. We scan the entire home while the blower door is operating so we can accurately detect where your air leaks are. We check to ensure that all of your combustion appliances (furnace, boiler, water heater, gas kitchen appliances, etc.) are working correctly and are operating safely. Our prioritized report will give you the entire picture of where your home needs the most attention to be as energy-efficient and healthy as possible. When repairs are needed we can refer you to qualified contractors to do your improvements after conducting a full audit or we can assist you if you prefer to do it yourself. We look for spikes in your energy usage at certain times of the year as tell tales of what your issues may be. We want to use all the data we can find to ensure the best solution for improving your efficiency. Additional charge for each 1000 square feet over 3,000 is $100. moisture or missing insulation with printed pictures. An important thing to remember is that not all energy audits are equal. The services range from home inspection companies that offer energy tune-ups as part of their inspections to a full-time professional performance-based contractor like us with a BPI Certification for new and existing homes. Be aware that some companies are offering very cheap or free audits only to get their foot in the door to sell you inflated services later. Be sure the auditor is working for your best interest. Be sure the certification your auditor has is aimed toward your home. Contact AEA and see how our assessment can help you!